This is an easy starter – you use ready-rolled pastry for the bases. 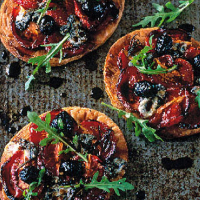 Alternatively, you could simply serve the topping ingredients on some rocket leaves or toasted bruschetta. Either way, the sweet and sour flavours are highly addictive. Preheat the oven to 140°C/gas 1. Put the tomatoes on a baking sheet, cut-side up, and season. Scatter needles from the rosemary sprigs over the top. Leave in the oven for 3 hours until the tomatoes are semi-dried. This can be done a day in advance. Preheat the oven to 200°C/gas 6. Take the pastry out of the fridge and let it soften. Unroll it and cut into four 13cm circles; place these on a baking sheet. Place another baking sheet on top of the circles. Bake in the oven for 25–30 minutes until golden brown. Meanwhile, place the sugar in a small pan with 3 tbsp water and heat until dissolved. Bring to the boil and cook to a deep gold colour. Take off the heat and pour in 2 tbsp cold water and the vinegar. Return the pan to the heat and stir until the caramel is smooth. Divide the tomato halves onto the pastry, scatter with the olives and Gorgonzola and return to the oven for 5 minutes to melt the cheese. Take out of the oven, scatter with rocket, then drizzle with the olive oil, followed by the balsamic vinegar caramel. The Corker recommends - Try a supple, full-flavoured, Argentinian pinot gris to calm the fireworks here.